Manchester United's Robin Van Persie celebrates winning the title on the pitch after the final whistle. THE PFA PLAYER of the Year shortlist was announced last week, and while six candidates were named, there are only three that can realistically win the prize. As consistently excellent as Michael Carrick, Juan Mata and Ezen Hazard have been, they have not quite performed the near-miracles that we have witnessed from Gareth Bale, Robin van Persie and Luis Suarez on a consistent basis. And indeed, there is a case to be made for all three to triumph, but ultimately, it must be looked at from the perspective of the one individual who has had the definitive impact on this year’s campaign. While Bale and Suarez have had to play with inferior teammates, Van Persie out of the three, has surely had to cope with the most intensive levels of pressure, persistently needing to ensure United maintained their push for the title. One other measure of a player’s greatness is also how well he performs on the big occasions, and Van Persie comes up favourably in this department too. He has six goals against the the other teams in the top 5 and Liverpool in the Premier League this season, with two more potential games to add to his tally. By contrast, Suarez has only four goals and no more potential games to add to his tally (even if he wasn’t banned). Bale, meanwhile, has five goals in these games, with one match still to play. Moreover, even in the less important games, Van Persie routinely excels – he is the Premier League’s top scorer, and barring an incredible flurry of goals from Bale in the final few matches, he will finish the season with the golden boot. Naturally, people will criticise the slightly underwhelming manner in which he has played towards the end of the season at times. And while there is no denying that he wasn’t at his best on occasion, the title race has been effectively over for quite some time, and RVP’s assistance was scarcely needed on account of United’s overt supremacy in the closing stages of the campaign. In addition, every player is flawed. Bale wasn’t exactly on fire for the first part of the season, and Suarez didn’t have the discipline – a quality that should not be overlooked – to stay out of trouble, and misses Liverpool’s final few matches as a result. Of course, that is not to say the Dutchman is likely to win the accolade – Ryan Giggs (2009) and David Ginola (1999) have both been awarded the honour, when there appeared to be more deserving candidates, so Bale or Suarez could just as easily prevail. And some people may complain if Suarez doesn’t win, suggesting it is down to a lack of popularity more than anything. Nonetheless, the likes of Roy Keane and John Terry – two people who were hardly the most well-liked players in the world – have received the award in the past. Similarly, a snub for Bale may lead some to claim he is a victim of the fact that he is playing for a less esteemed club than RVP. However, if that were the case, he surely would not have been granted the same award in 2011, when he was nowhere near the level of his current exhilarating career-best form. Therefore, Van Persie is the only logical choice this year – no other player influenced the big matches at the optimal times to as great an extent as he invariably has, and for that simple reason, he deserves to be hailed as the league’s most outstanding individual performer. Email “Opinion: Why Robin van Persie deserves to win Player of the Year”. 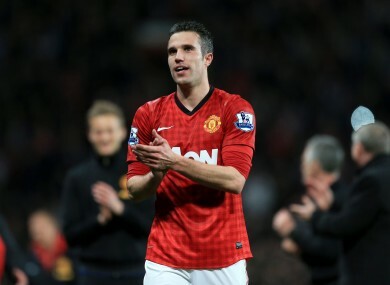 Feedback on “Opinion: Why Robin van Persie deserves to win Player of the Year”.